Can we be serious for a moment? Let’s talk coconut. Coconut, this luscious (super)food that seems to be in a constant identity crisis, something we can all relate to from time to time, yes? 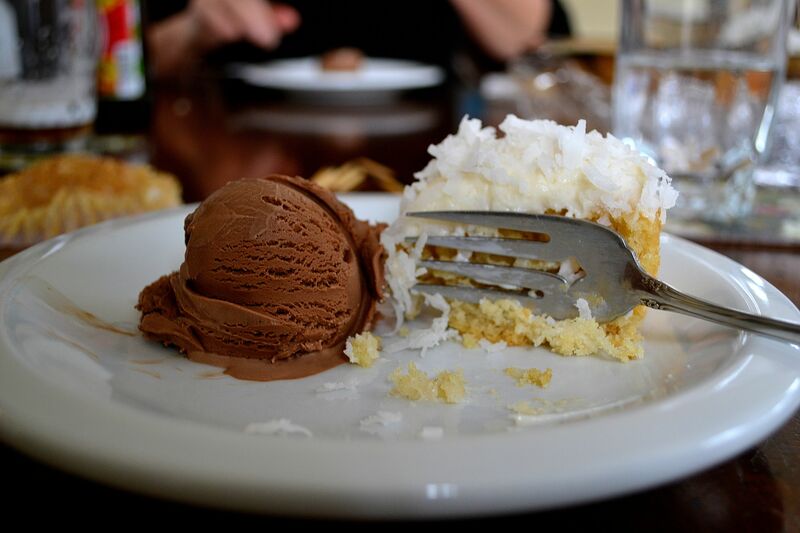 Coconut, always waffling between savory and sweet, breakfast and dessert, soups and ice cream, muffins and salads. I crave, on a weekly basis at least, this salad, inspired by Heidi, but am even more likely to sprinkle some of that unsweetened, shredded goodness on my morning bowl of oats. I typically use the unsweetened variety, of course (what else would you expect from me?) and I can’t imagine the sugary stuff would pair very well with briny tamari. Dessert, however, is where that oh, so chewy, sweetened stuff finds its home. Easter, much like Christmas, is important to me not because I am a particularly religious person but because it means family. Easter means an opportunity for my family to take a step back from our everyday schedules and come together at the dining room table to share a meal, reminisce about holidays past, and make sure everyone’s doing well before heading back out into that crazy-busy real world. This year’s Easter also meant celebrating my brother’s 22nd birthday in person rather than through a post on his Facebook wall or quick call when I think he is between classes. While everyone in my family has always had an affinity for sweets, my baby bro’s relationship with sweets takes the cake. (I would say no pun intended but, please, we all know I totally meant it!) Knowing that he would already have gorged himself on marshmallow Peeps and jelly beans (Lord knows, I’ve been sneaking handfuls of mini Cadbury eggs all week! ), I wanted to make a dessert that everyone would love but that wouldn’t leave us with our heads on the table, drooling in a sugar-induced coma. A few tips and some wiggle room: I used unsweetened almond milk. Any non-dairy milk or cow’s milk is fine. Additionally, you could use buttermilk instead. The act of adding 1 tablespoon of vinegar to a cup of milk causes the milk to curdle slightly and creates the same consistency as buttermilk. I never have buttermilk on hand but always want the incredibly rich and fluffy texture that it provides to baked goods. This homemade alternative is a great solution! It is great i everything from muffins to pancakes. I made these cupcakes a night ahead of time and frosted them the morning of our Easter lunch. Cream cheese frosting really should be refrigerated so this just avoided the need to make fridge space for 16 cupcakes. You should do whatever suits your life at the moment. Got it? Let’s get to it! In a medium bowl, whisk the safflower oil, vanilla extract, almond extract, and almond milk/vinegar mixture. Fold into the flour mixture until just moistened. After adding the shredded coconut, mix until thoroughly combined. Using a 1/4 c. scoop, portion out 16 cupcakes. 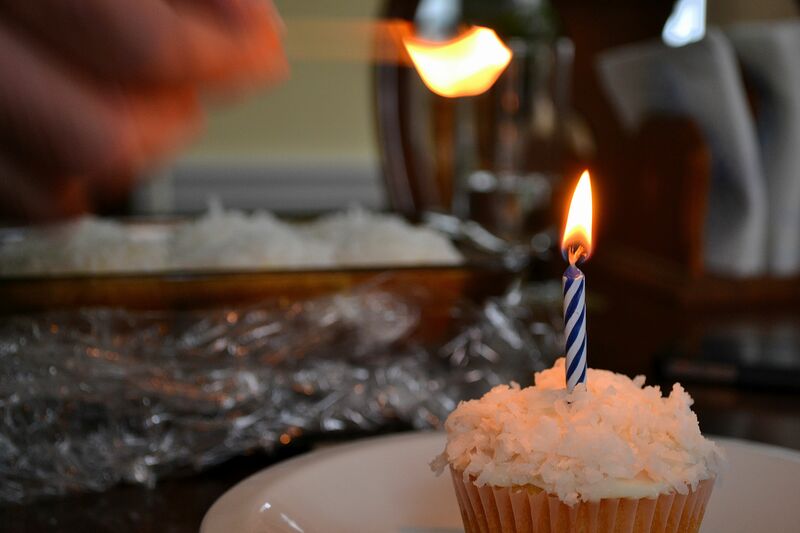 Bake for 16-18 minutes or until a toothpick comes out of a cupcake clean. In a stand mixer, or with an electric hand mixer, blend all four ingredients. It’s that easy! We served our cupcakes with chocolate ice cream from J.P. Lick’s. I was worried that dessert wouldn’t really be dessert without some chocolate and I was right! The ice cream absolutely enhanced the flavor of the cupcake and made it feel like a true birthday party, to boot. 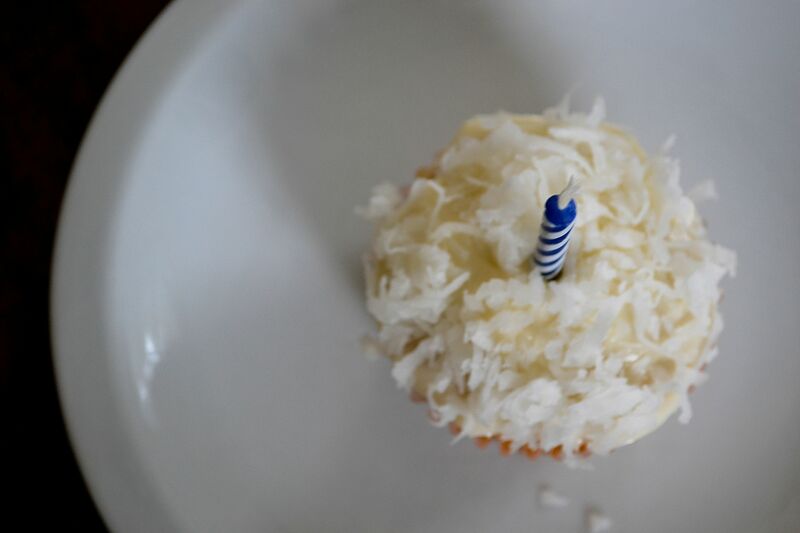 These cupcakes are light and fluffy and just bursting with coconut flavor – and of course are totally loaded with chewiness from the shredded coconut in the cake and on the frosting. A birthday success? I’d say so. You’re back! YAYYYY! Seriously, I think by this point I have probably printed out ALL of your recipes and put them in my (much abused) binder of delicous meal choices. Thanks for sharing the kale salad recipe too–that looks AMAZING and I’m going to have to try it out soon.